Hard to believe that the year’s half over, isn’t it? Perhaps it’s because Macro Man has had other things to worry about than just markets in 2009, or perhaps because the older you get, the faster time passes. But man, it seems like the year just started, and here we are at the end of June. Now would appear to be an opportune time to reassess the views that Macro Man carried at the end of 2008 by marking his ten non-predictions for 2009 to market. (The original posts can be found here and here.) And so, without further ado…. 1) Last year’s lows in the S&P 500 will NOT hold. The SPX made a low of 741 in November 2008, which Macro Man was fairly confident would not hold this year. Unfortunately, he expected a bit more of a rally in Q1, and so was wrong-footed when the SPX crashed to a low of 666 in early March. Such is the difference between forecasting and trading; the forecast was a clear HIT, but the trade was, alas, a miss. 2) 2009 GDP forecasts from the Fed, ECB, and the UK Treasury will NOT be achieved. This was a pretty easy one, as the 2009 domestic growth forecasts for these three were +0.45%, -0.5%, and -1.1%, respectively. While it seems that “green shoots” mania has been around forever, current consensus forecasts for the US, EMU, and UK growth are currently -2.7%, -4.3%, and -3.55%. Again, although the economics call was a HIT, one might reasonably have expected equities in these three economies to be worse than unched given the negative growth surprise early in the year. 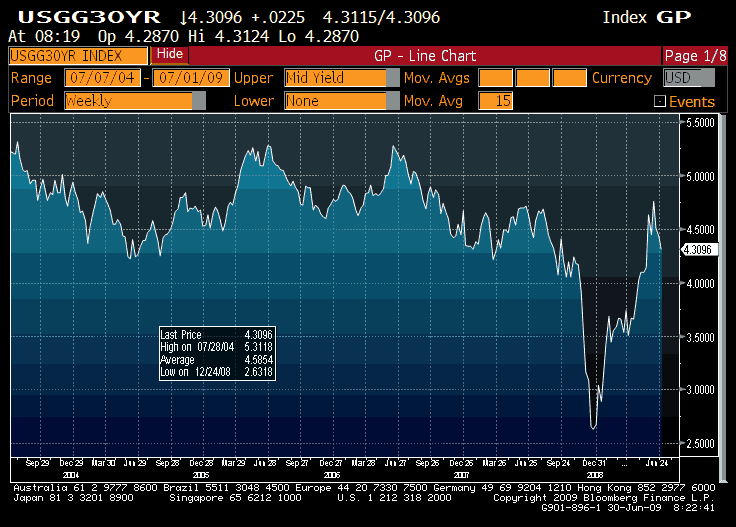 3) The “bond bubble” will NOT pop. Any evaluation of this non-prediction needs to set out the terms of analysis. Despite much hand-wringing from the analyst community and moaning from BRIC central banks, Fed custody data confirms that foreign central banks have not abanadoned the dollar or the Treasury market, while domestics have also stepped up to buy bonds. 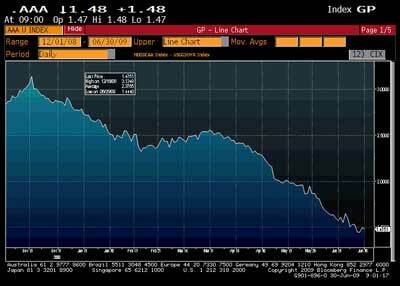 That having been said, the bond squeeze at the end of 2008 was pretty extraordinary, and, as the chart of 30 year yields below demonstrates, was swiftly unwound early this year. 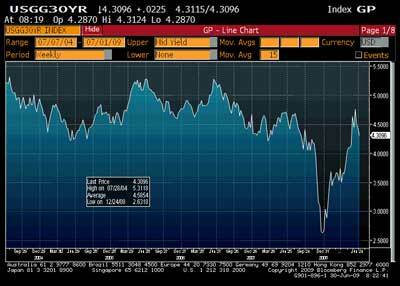 Insofar as 2.75% 30 year yields represented a bubble, that bubble has popped, taking yields back to earlier levels. So we’ll call this one a MISS. 4) Oil (defined as the second WTI contract) will NOT trade at either $25 or $100 in 2009. The second WTI contract ended 2008 at $48.59/bbl, and is now trading at $73.10/bbl. So it’s gone from roughly $25 away from the lower threshold to $25 away from the upper one. From Macro Man’s perch, the primary risk to this non-prediction was that the lower bound was reached early in 2009, a hurdle that was successfully surmounted. However, with six months to go and green shoots mania still in full effect, it’s still waaaaaaaayyyyy to early to declare victory. So for now, the jury is still out. 5) VIX will post a higher average in 2009 than 2008 but will NOT reach 2008’s peak. This looked like a great call in Q1, when new lows in the SPX were not matched by a new high in VIX. 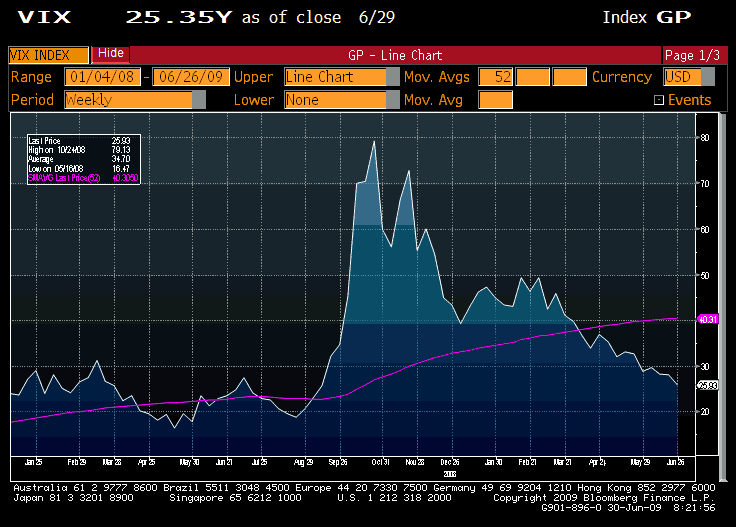 And for now, both the 52-week (40.3) and 26-week (38.5) moving averages in the VIX are well above the 2008 average of 32. However, with half the year to go, the current reading is well below last year’s average, and looks set to fall further should equities remain here or rally. While this isn’t Macro Man’s base case, he’s been confounded by the resilience of equities for some time now. So once again, the jury is still out. 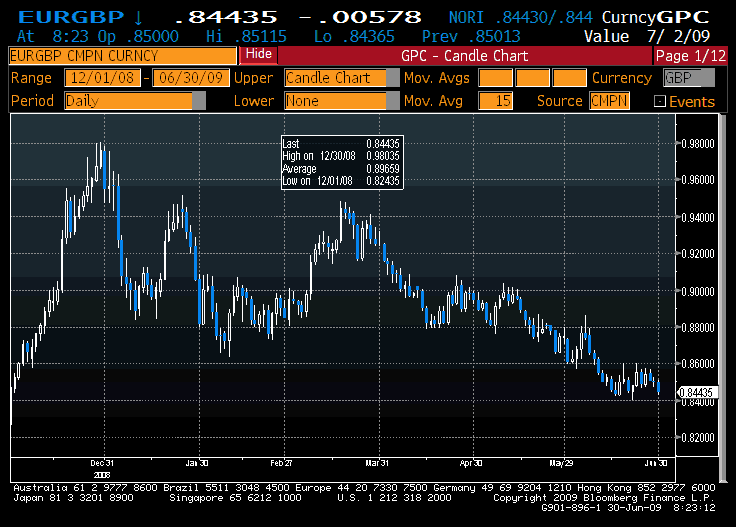 6) EUR/GBP will NOT trade at par. The cross ended last year north of 0.9500, so it makes sense to conclude that if it were going to trade at par, it would have done so early on in the year. And despite a veritable of Everest of bad news thrown at the pound (QE, Parliamentary disgrace, horrible growth, etc. 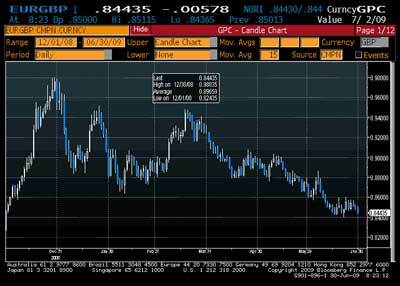 ), the pound has staged quite a tasty recovery against the single currency, currently trading just south of 0.8500. While there are still six months to go, it seems reasonable to chalk this one up as a HIT for now. 7) The DXY will NOT make a new low in 2009. It was little more than a year ago that EUR/USD (which comprises 57% of the DXY) traded north of 1.60 for the first time, and less than a year since it made its eventual high. While the usual “dollar going down forever” crowd has regrouped, particularly in the wake of Fed QE, for now the DXY remains 12.5% above its all-time lows. Given that the current account deficit has narrowed sharply, the DGDF crowd have shifted their focus to the budget deficit (neatly forgetting the possibilities that this can be largely funded out of domestic savings, now that there are some.) While Macro Man remains pretty confident of the view here, a lot can happen in six months, and there seem to be a lot of people who reaaalllyyyyyy want the dollar to go down. So we’ll have to say that the jury is still out. 8) China will NOT stop taking the piss in currency markets. Remarkably, the seemingly inexorable pace of Chinese FX reserve accumulation paused in Q1, and Macro Man’s pal Voldemort took a break from treating EUR/USD like an orca treats a baby seal. However, even when they weren’t busy punting other peoples’ currencies, PBOC and SAFE still managed to make waves with a seemingly endless stream of “we need an alternative to the dollar/no we don’t/yes we do” commentary. Needless to say, this added a fair amount of volatility to the market without managing to accomplish a whole lot else. And guess what? Now that the Chinese are going to save the world economy, their reserve accumulation has ticked up again and they (along with the oil producers) have started playing in currency-land again. Hooray! We’ll call this one a HIT, which, incidentally, is what a lot of punters of Macro Man’s acquantiance would like to do to SAFE. 9) High grade credit spreads will NOT reach their wides of 2008. The success of this call perhaps depends on the metric used to evaluate it. As a handy reference, Macro Man looks at the spread of AAA corporate credit (using the Moody’s index) to long-term Treasuries. On this metric, at least, credit has indeed not reached last year’s wides, even as lower-grade stuff like European crossover made new wides in early March. Macro Man wwill call this one a HIT, though perhaps a credit expert could provide contrary evidence. 10) The approval rating of Gordon Brown and Barack Obama will NOT be as high as they are now at the end of 2009. The rationale for this one was simple; even last December, Gordon Brown looked like a dead man walking, while expectations for Obama were so high that they were almost blound to be disappointed. Courtesy of the economy and the MP expense scandal. Brown’s Labour finished a distant third to UKIP in the recent European elections. Call that one a HIT. Obama’s current approval rating of 59% is well below last December’s 67%, but still close enough that it could conceivably rally back should the economy somehow manage a V-shaped recovery. We’ll say that the jury’s still out on this one. So there you go. Five and a half hits, one miss, and three and a half “jury’s still outs”. Not a bad result, even if the exercise of predicting what won’t happen is a bit easier than predicting what will. Still, while Macro Man has had some investment success in H1, his returns and hit ratio haven’t matched his success in making non-predictions. Which just goes to show, if you didn’t know already, that successfully managing money requires more than just an ability to figure out what will or won’t happen; it also requires an ability to articulate a view into winning trades. This is easier said than done at the best of times…..all the more so, Macro Man has found, when you’re out of action for a while with a bum knee. Still, there’s half the year remaining, and it’s all left to play for.